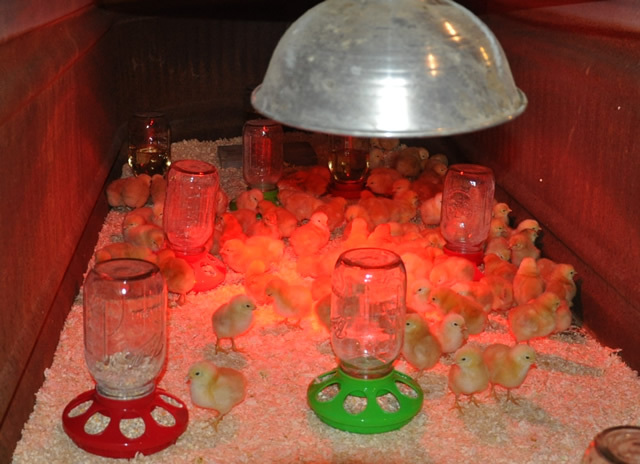 Our first batch of chicks arrived this morning. They are New Hampshire Reds—a “dual purpose” breed. We will keep some to start our laying flock. The rest will be processed as meat birds in late July. Before the 1960’s, most broilers were breeds like the New Hampshire Red. Nowadays, the only breed you will find in the supermarket is that freakish franken-bird known as the “Cornish Cross.” The Cornish cross is bred to grow as much breast meat as fast as possible. They grow so fast that their legs don’t work properly, so they can barely stand up. Although New Hampshire Reds grow slower, they are far more suited to our holistic approach to farming. What remains to be seen is whether the market here will forgo the “breast meat” bird for the more sustainable, smaller, 1950’s-style broiler chicken. We’ll certainly go for the NH Reds! Just let us know when. Great to here – look forward to ordering some when available! I’m willing and waiting to try them; what I’ve heard is that they taste better!